Rarely is the awesome power of mother nature witnessed so spectacularly than in the form of this “lava firehose” – piping hot molten rock being expelled at high velocity from a volcano in Hawaii. 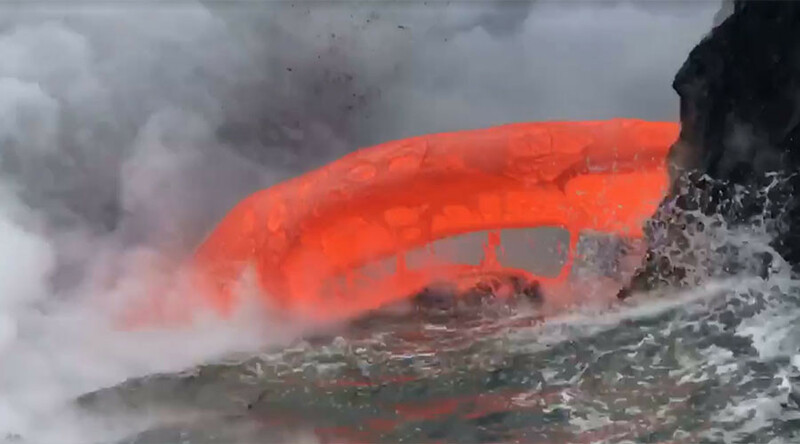 A video released by Hawaii’s Volcanoes National Park Service at Kamokuna on January 9 shows a dazzling “lava firehose” shooting a relentless stream of the molten rock from deep inside the earth. Describing it as “surreal” and “unbelievable,” viewers have been left awe-struck at the spectacular sight, with the video viewed almost 900,000 times so far on Facebook, amassing nearly 15,000 shares in the process. It’s not an entirely-rare occurrence, however, with visitors to the volcanic island usually able to marvel at lava flows from a designated viewing platform. However, footage of this latest phenomenon has emerged just days after a large section of a delta at Kamokuna collapsed into the sea, causing the tourist viewing area to be temporarily closed.